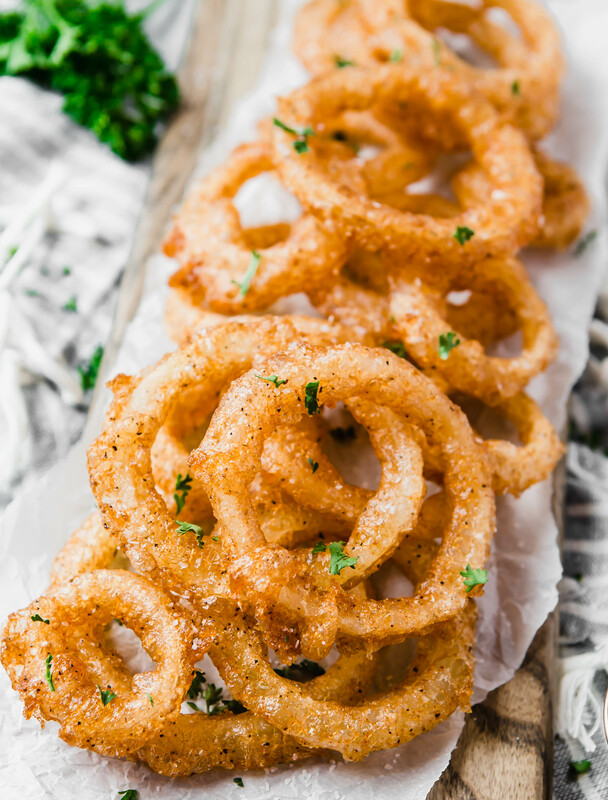 Easy, completely paleo, and allergy-friendly deep fried onion rings that you can make at home. These are a great appetizer for a football game or to serve along burgers at a summer BBQ! The batter is made with Chebe garlic onion breadstick mix. When I was first diagnosed with Celiac Disease, one of the very very first brands that I knew of as a good gluten-free bread alternative was Chebe. Their products are made from tapioca starch which comes from cassava, a root vegetable. 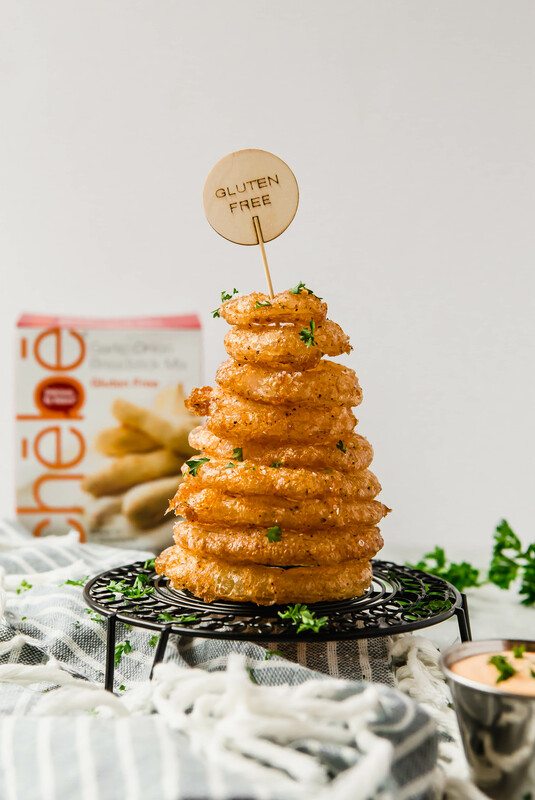 Chebe mixes are naturally gluten and grain-free (plus free from soy, corn, dairy, yeast, sugar (except for their cinnamon roll mix), eggs, nuts, and basically everything!) and so versatile. It has a chewy texture, making it a great “regular” bread replacement. If you’re eating gluten-free then you understand that typically our bread options are dry and crumbly. I know you know what I’m talking about! I’ve been hearing so many people lately are having trouble with gluten (and grains). Some grains can be hard to digest, cause inflammation, and give you a sluggish feeling. I even know some people who are eating a paleo diet, which excludes ALL grains such as rice, corn, quinoa, oats, etc. (among other things). I am so excited that Chebe products can be used to make paleo recipes! You’d never even know!! I was really excited to make these onion rings work! No added flours are in this batter, just the Chebe mix! And if I can make these at home, then I know you can as well! I’ll admit that these are a little time-consuming, but oh so worth it! You can use avocado oil to make these completely paleo, which works great because it has a high heat point. I buy the big jug of avocado oil at Costco. If you don’t care about these being paleo and want to use a cheaper alternative, then you can use canola oil or vegetable oil. These are so light, fluffy, and crispy and it’s amazing they are gluten and grain-free. We recently got a fairly cheap deep fryer at Target. We’re saving it for special occasions so we don’t get into any bad habits. 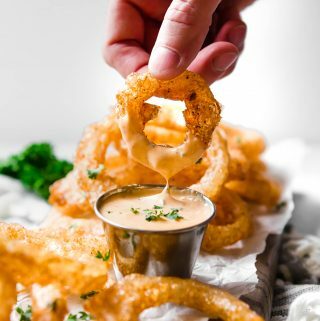 The fryer helps make this process a little quicker, but it’s absolutely not necessary to have one for this recipe. Just the stovetop, a deep pot, and some oil will get the job done! I do have some helpful tips to get the crunchiest and freshest tasting fried foods using a pot on the stove. Make sure the oil is hot enough. You want the oil to be at 375 degrees. You can find an inexpensive thermometer on Amazon. Next to the stove, lay out a cooling rack (like a cookie rack) and a few layers of paper towels on top. Try to let as much oil as possible drip off the food before placing on the paper towels. This will help to keep them crispy and not taste oily. 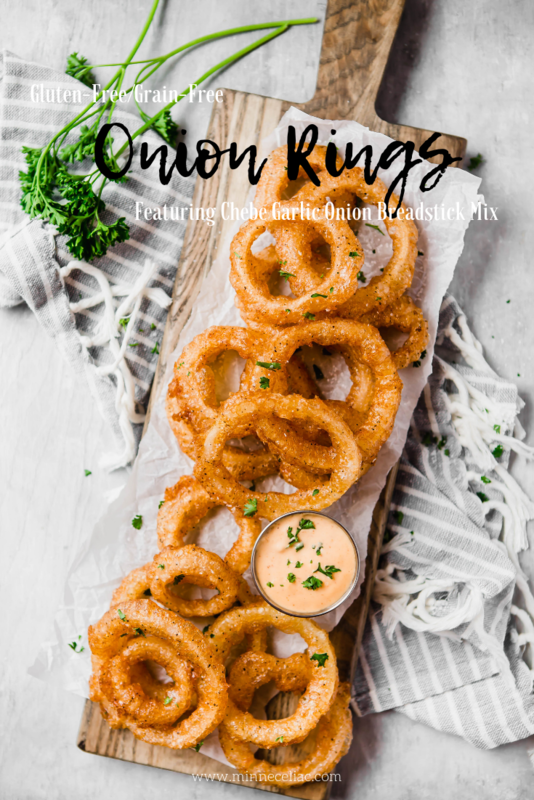 I like to use a fork to the take the onion rings out of the wet batter and place in the oil. 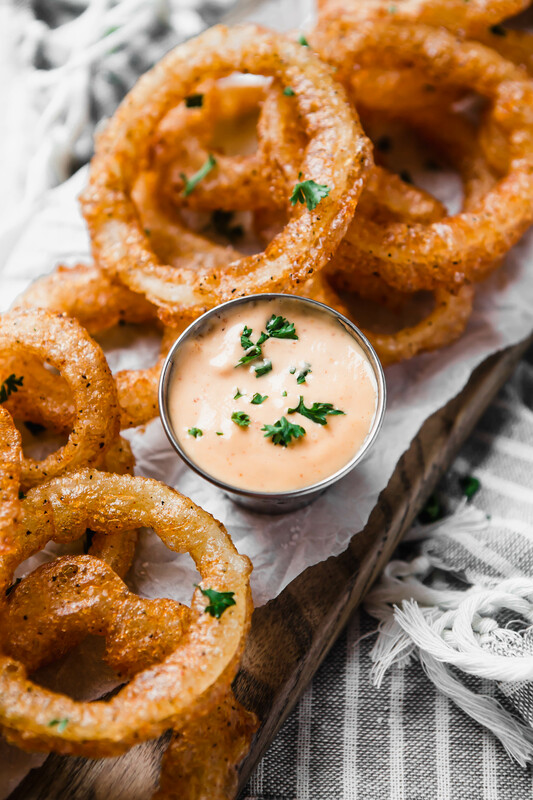 I’ve found that if I use my fingers, the batter comes off of the onion rings and then they cook unevenly. I then like to use large tongs to take them out of the oil when they are done. Don’t overcrowd the oil. In fact, I do maybe three onion rings at a time. If you overcrowd the cooking vessel, then the food can get stuck together and cause uneven cooking. Salt the food right when it comes out of the oil (do this whether you’re making it on the stove or in the fryer). You can make these a few hours ahead of time, but they might get a bit soggy. To crisp them up again, place on an oven safe cookie rack on top of a baking sheet. Then bake them in a 300 degree oven for about 15 minutes. I also threw together a quick dipping sauce. All you need is mayonnaise and sriracha. Easy! Mix together about ¼ cup mayo and a couple tablespoons of sriracha, depending on how spicy you like it! There are some fun and tasty aiolis out there now so you can choose whatever flavor combination you’re in the mood for. 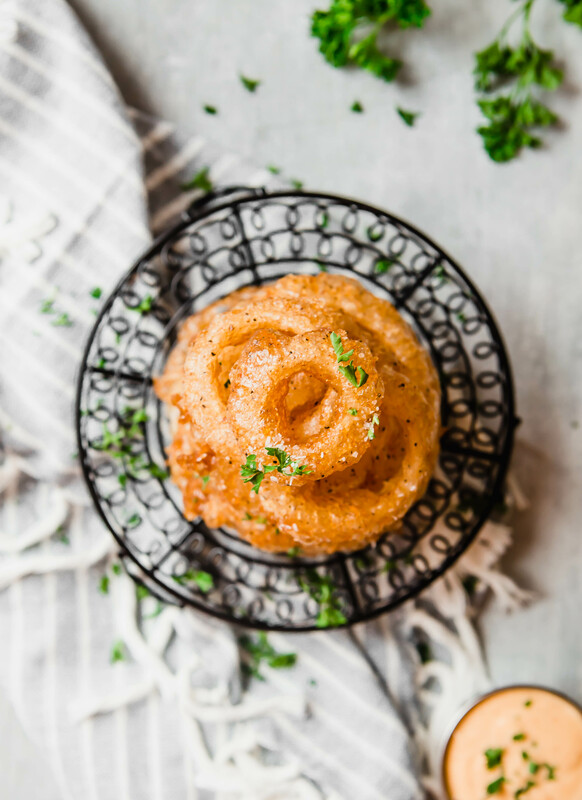 I think a creamy, spicy dip is perfect with fried foods! Another great option for this recipe…green beans! Never tried deep fried green beans? You should! Add in 1 teaspoon salt, 1 teaspoon pepper, and 1 teaspoon paprika. Whisk all dry ingredients together. Heat oil to a temperature of at least 375. If you can't find the garlic onion breadstick mix, don't fret. You can use the original cheese bread mix or all-purpose bread mix. Just add in another teaspoon of garlic powder to the wet mix. Want to run out and find some Chebe mixes near you? Here is a link to the store locator!